How do I back up Fences snapshots? A link at the bottom is for prior Fences owner discounts. 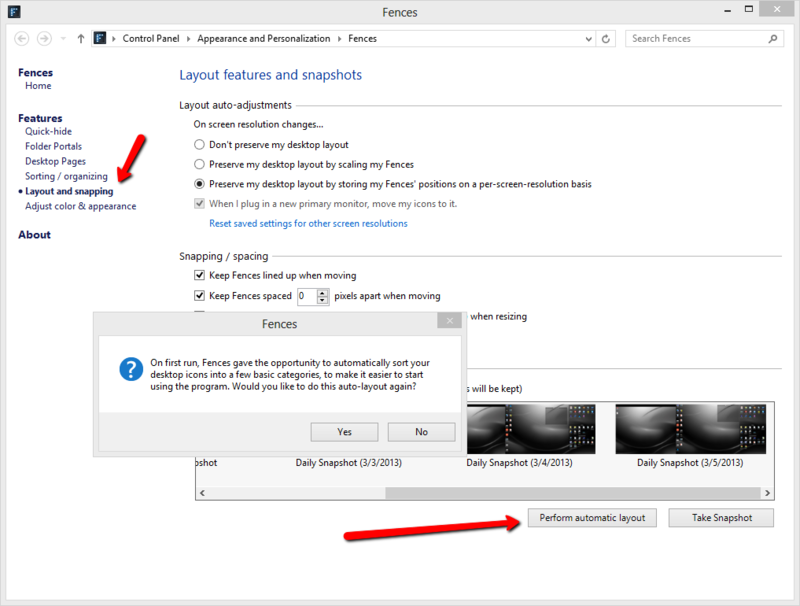 Fences 1 is not supported on Windows 10. 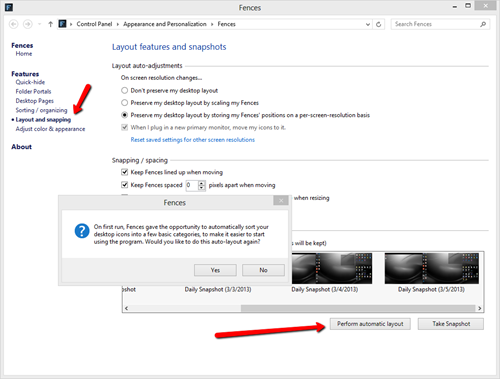 With the latest Windows 10 - Creators Update (April 2017), certain Fences 2 features may longer function consistently or as expected. We suggest upgrading to Fences 3 so you can continue to use all the great features Fences offers. -Using the wrong email / not the same one you initially activated Fences with. If you find that disabling the quick hide brought your icons back, you can re-enable it and then double click on the desktop to bring the fences/icons back. Another double click would hide them again. 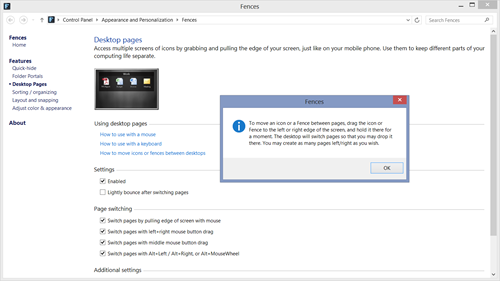 If this does not help you, another thing to check is if you are using Windows 7 or greater, please make sure you may have not inadvertently put the Fence on an alternate Desktop using Desktop pages. If you find that disabling desktop pages brings your icons back, this means that they were likely on another page. 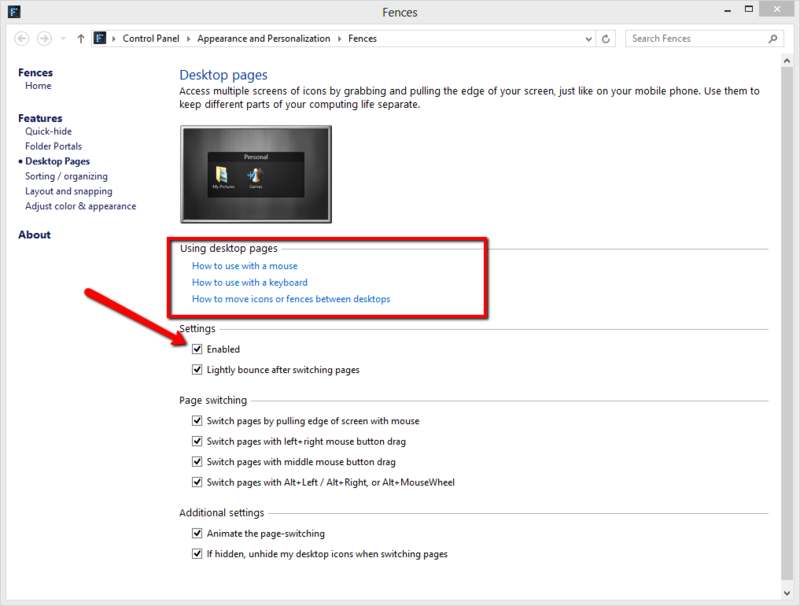 If you wish to use the desktop pages function, you can re-enable it and then switch to the page that your icon/fence is on by using the instructions in the highlighted box above. If you want to move your icon/fence back to where the others are, you can drag it to the edge of the screen in the direction your main page is and it will switch pages. If you have shortcuts or icons you create that are not being sent to the "Primary" monitor while using Fences, please follow the instructions below. 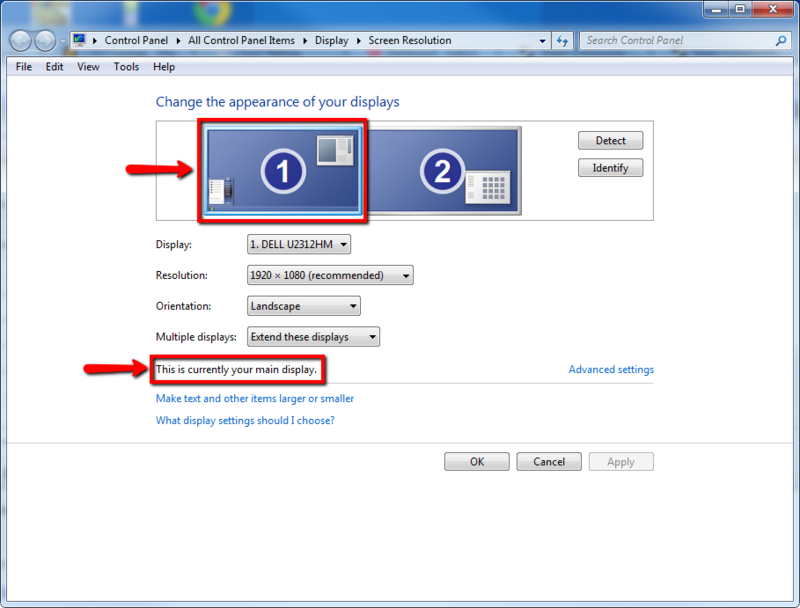 Double check your display settings to make sure your primary monitor is set correctly. 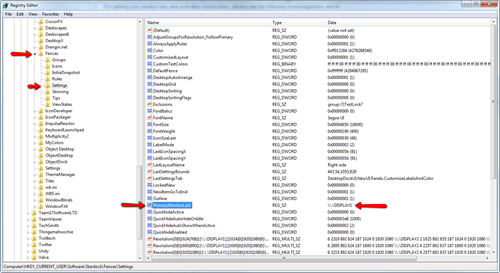 If your primary monitor is set correctly, you may have a registry entry with an incorrect key. In Fences you can back up and restore snapshots of your layouts. -If you wish to take a snapshot instead, use the 'Take Snapshot' button. Open the configuration application and select "Tools"
You can create a snapshot by selecting the button. Select a snapshot to preview it. If it is the one you want, select the "Restore Snapshot" button. You can also delete snapshots here. If you do not want to create snapshots you can do that on the previous page. 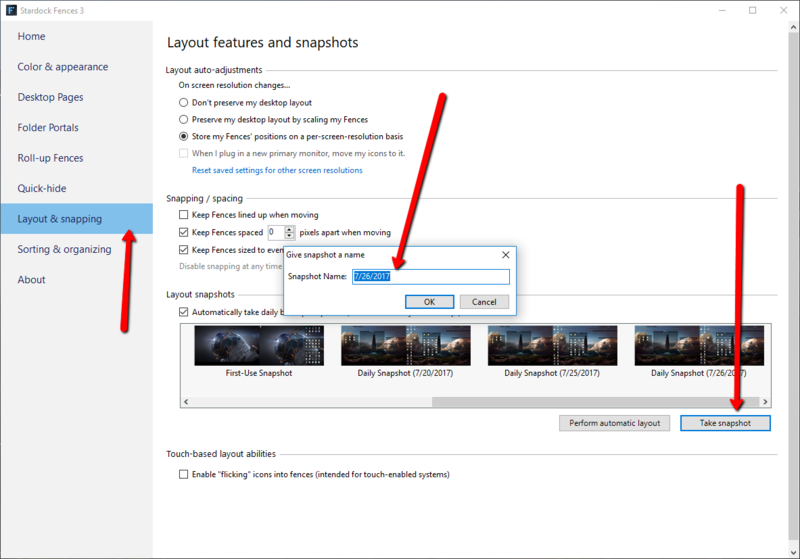 If you want to move settings from one machine to another you can do that via the snapshot system. The easiest way to backup and restore Fences settings is via the snapshot system. Simply copy the snapshots from one machine to the other, then restore the snapshot. The list view is only supported on folder portals. If there are items in another fence that you wish to view like this, you could create a new folder, move the shortcuts into that new folder and create a folder portal linking to that folder. It could be that the Fences are locked. 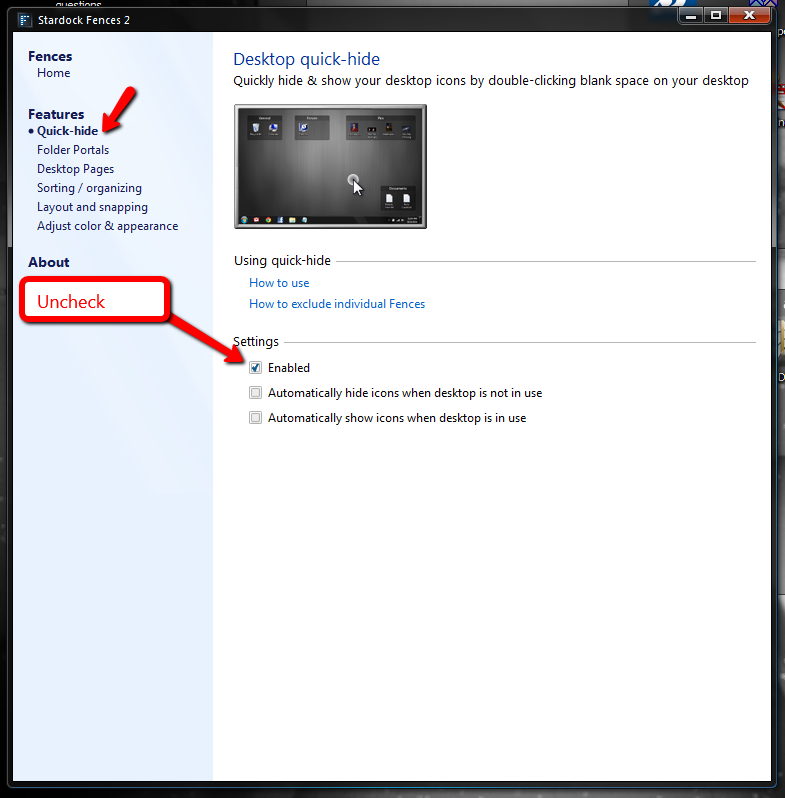 Try right clicking on an empty area of the desktop and then do the following. Once that has been done, see if you can use the controls on the fence or move or resize it. Resetting Fences to the default state is useful if you want to get back to the original setup so you can start over. It also can help when troubleshooting issues with Fences. 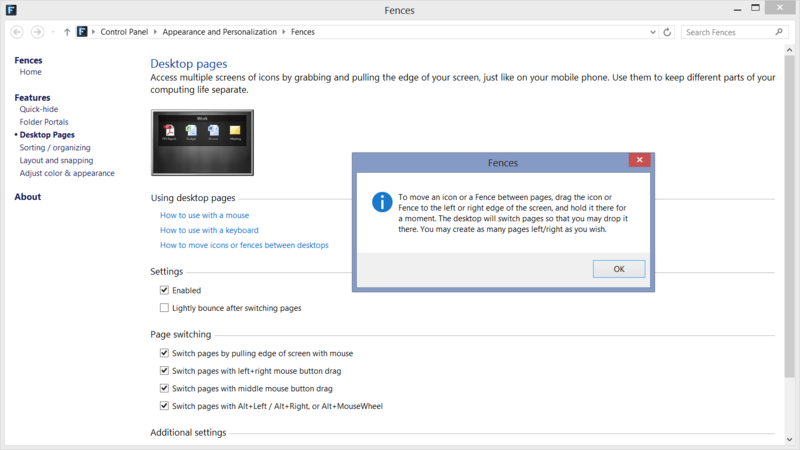 To reset Fences to its initial install state, right click on an empty space on your desktop and select 'Configure Fences'. 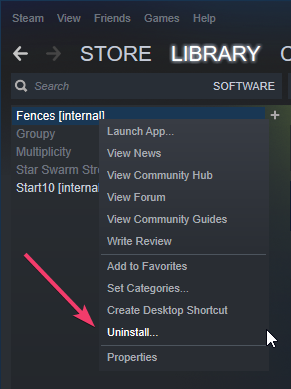 This should reset your desktop to its original state when you installed Fences. We cannot assist you unless they are fully disabled / uninstalled. -Use of various docking stations and migrating to and from them. 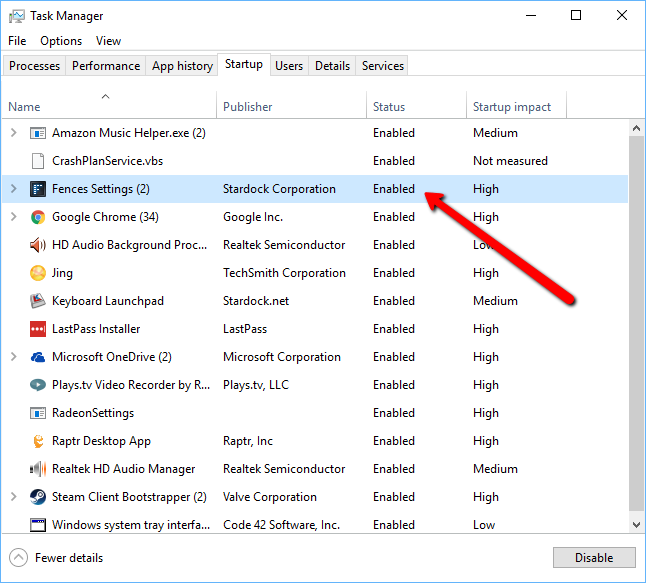 -Allow PC to sleep (thus disabling / re-enabling monitors in an abrupt and destructive way). -Different scaling on a per monitor basis. For this, there are some things to try when oddities are seen. 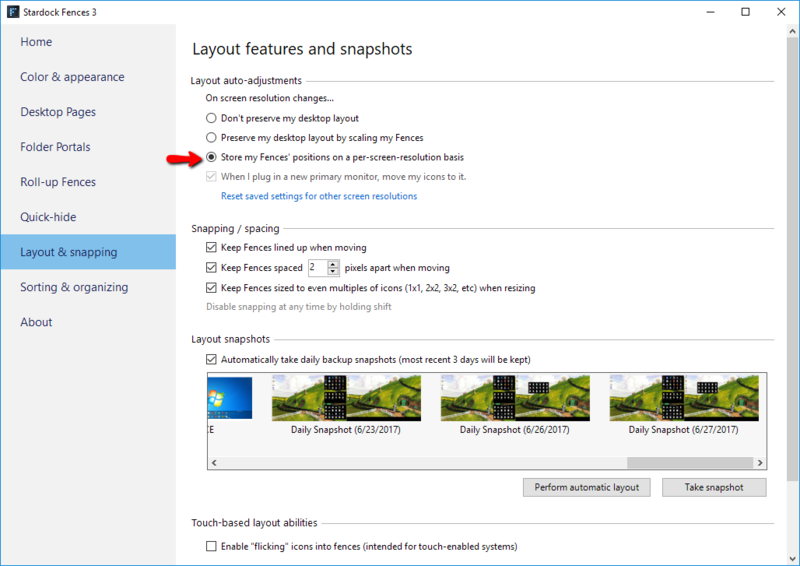 If that does not help, try the 'Reset saved settings for other screen resolutions' option. It would be prudent to create, and save, custom snapshots based on your circumstance (docking station with multiple monitors vs without). You can set up a bucket Fences that exists on any monitor you like. With that, any icons you want to go to a specific monitor will do so based on the rule and where the Fences exists. At this time, we are not providing Steam keys for prior Fences purchases made through the Stardock store. If this changes, we will let clients know. Fences can sometimes have trouble with network shortcuts on the desktop when the destination is no longer available (you are not on that network any longer or Fences starts prior to the network location being available). You can change the language used in Fences from simplified Chinese to English by adding 'en' to UserLang in HKEY_CURRENT_USER\Software\Stardock\Fences. We've made a reg key to simplify this process. Download the key below and extract it. Double click the key and follow the prompts below. After you click ok, log out and back into Windows. Fences can be disabled for the default user through a change in the registry. The following batch file will disable the upgrade check Fences does periodically. It will only work on Fences 3.05 or greater. 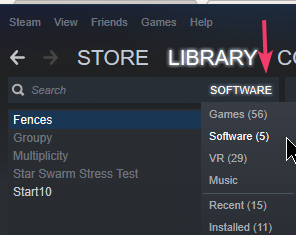 Then re-Install from Steam and Steam only.